Two Royal Canadian Air Force CT-155 Hawk training jets will conduct a flyby over Percival Molson Memorial Stadium after 1 p.m. as part of the Montreal Alouettes' Canadian Armed Forces appreciation game. If you hear the sound of jets overhead on Sunday, there's no need to panic. 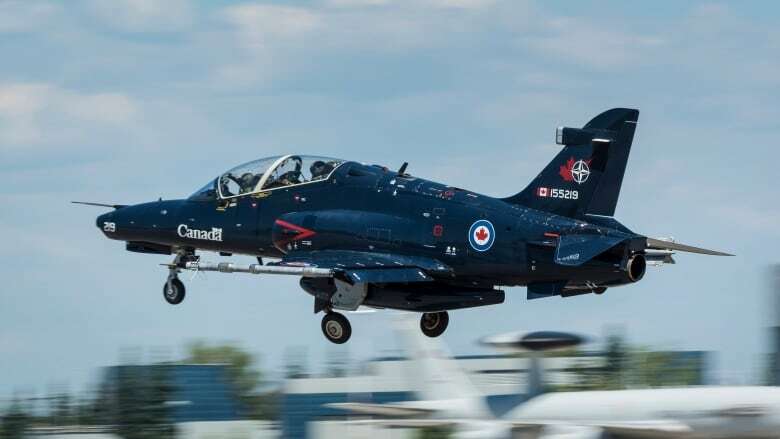 Two Royal Canadian Air Force CT-155 Hawk training jets will conduct a flyby over Percival Molson Memorial Stadium between 1:04 p.m. and 1:08 p.m. as part of the Montreal Alouettes' Canadian Armed Forces appreciation game. The Air Force had previously said the flyby would occur in the morning, but the Alouettes have since clarified the time on the team's website. The Alouettes are hosting the Saskatchewan Roughriders on Sunday. The theme of this first fall game is a nod to the history of the Montreal team which was named after the 425 Tactical Fighter Squadron, the first French-Canadian squadron of the Air Force known for its tenacity and dedication, the Alouettes say. The jets are from the Canadian Forces Flying Training School in Moose Jaw, Saskatchewan. In a statement, the Canadian Armed Forces said the jets will reach a minimum altitude of 500 feet above the stadium and will return to a higher altitude for the rest of the flight.